Robert Chambers shows a photo of his sister and himself featured in the book “Courage in a White Coat,” while at his home in Loveland. GREELEY (AP) – They are characters in a book now. But before that, they were characters in history. Bobby, however, soaked up all the rumors like a little sponge. In March, Bobbi Chambers Hawk left Lincoln, Nebraska, to join the staff at Greeley’s North Colorado Medical Center as a neonatal ICU physician. Missionary doctor Dorothy Kinney Chambers was Dorothy in the above snippet set in the Santo Tomas internment camp in the Philippines during World War II. Young Bobby in the book is Bobbi’s father. He was 4 at the time of that scene. As Bob Chambers, he is now 78. The Fort Collins High graduate was head of a combat film team while in the Air Force during the Vietnam War, then a long-time professor of technical theater and design at Southern Methodist University. In February, Bob Chambers moved from Lincoln to Loveland with his wife, Mame, joining Bobbi in northern Colorado. 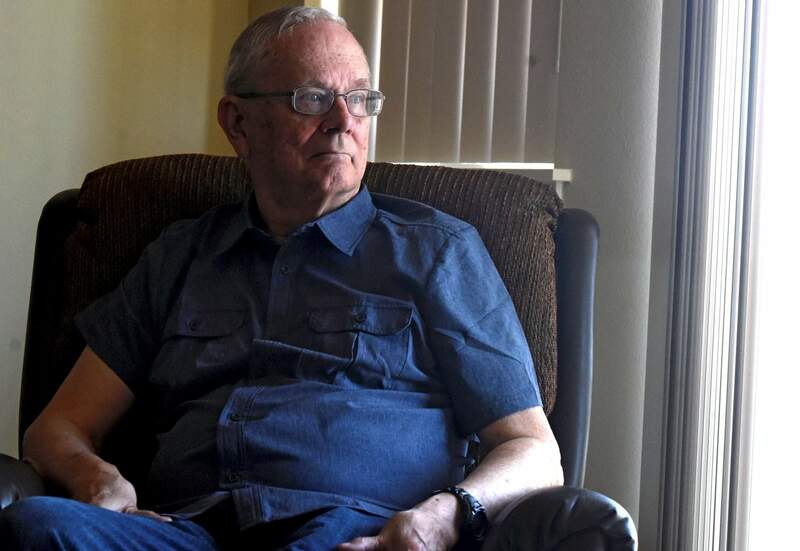 “I grew up in Colorado, moved away and spent 50 years of my life regretting it and wanting to move back,” Bob said in his retirement home apartment. The Chambers family, once entrenched in northern Colorado, has come home – just in time for the release of “Courage in a White Coat,” author Mary Schwaner’s fact-based novel about Dorothy Kinney Chambers. 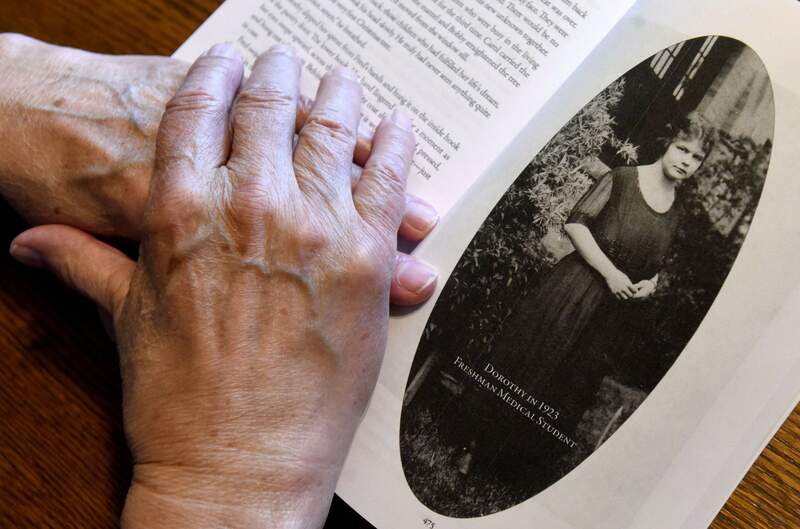 Robert Chambers’ hands rest on the book as a photo of his mother, Dorothy Kinney Chambers, looks up from the page at his home in Loveland. The other day in Greeley, Bobbi Chambers Hawk took a break from her high-pressure, high-reward job at NCMC. As we sat in the coffee-stand area near the main entrance, I asked her about her first memories of her trailblazing grandmother. And, oh, the stories that Hawk’s grandmother could tell. Dorothy entered the University of Colorado’s School of Medicine in 1923 and was second in her class. After graduation, she treated the poor in northeast India for 10 years, often reading about and learning surgical procedures on the fly. When she arrived at the missionary compound, conditions were primitive – no running water, no electricity – and she shaped and developed that into a “modern” hospital in Assam. Dorothy married Fred Chambers, a widower Baptist missionary she met in India, in 1936, and daughter Carol was born in November 1937. Just as World War II began in Europe in 1939, the family moved on to the Philippines, and Dorothy worked at a mission hospital in Iloilo. The family grew to four when Bobby was born in February 1940. After war broke out in the Pacific and the forces of Japan took the Philippines, Dorothy, Fred, Carol and Bobby from April 1942 to February 1945 were interned in camps at an Iloilo prison and at Manila’s Santo Tomas University. Returning to Colorado after the war, Dorothy lived her later years in Boulder and Fort Collins. Following Fred’s 1985 death, Dorothy took her story nationally on the lecture circuit. Many of her listeners walked away thinking her story deserved a wider audience. Her family had thought that for years. The book came about because of a confluence of circumstances. Mary Schwaner was the director of web and media arts at Mame and Bob’s church, St. Mark’s United Methodist in Lincoln. She had a varied background in music, computer technical support and as a writer and publisher of romance novels with her one-person operation, Prairie Muse Publishing. “From the first words out of his mouth, I was hooked,” Schwaner said from her home in Lincoln. “I came to understand more fully who she was and what she was like,” Schwaner said. Robert Chambers, son of missionary surgeon, Dorothy Kinney Chambers, spent his toddler years in Japanese prison campus with his family from 1942-45. His mother is the protagonist in new book, “Courage in a White Coat,” by Mary Schwaner. The novel is a mix of a storyline from the detailed letters; extensive research, sometimes cited in separate “drop-in” material from other memoirs and works; and speculation to fill in the blanks, especially with the dialogue. “That was a huge challenge,” Schwaner said. “Many scenes I wrote and rewrote and rewrote because I was either hesitant to express the full emotion, or I would go too far in imagining what the situation might have been like. Schwaner’s most obvious examples of dramatic license are in the material about the POW years, especially during the 20 months, beginning in June 1943, the family spent at Santo Tomas. There was no mail allowed out of the camp, so Dorothy’s prolific writing was put on hold and her worried family members, who had been receiving weekly missives during her postings, had to cope with silence. At the camp, numbers fluctuated, but in general, the majority of the 4,000 diverse internees from around the world were Americans. About 400 were children, and Dorothy treated them at a makeshift hospital. Bob told me his memories of the time (as “Bobby”) are foggy, but he signed off on such things in the book as that exchange about the possible arrival of liberating U.S. forces, and a symbolic scene where he draws on a napkin as famished internee kids beg Japan’s soldiers for food at their mess tent. In that scene, fascinated soldiers watch and implore Bobby, in later life also a cartoonist for Kitplanes magazine, to keep drawing for them. In the book, he gestures that he will do so only for food. Schwaner bases that on a “kill all policy,” read into the record at a 1947 Tokyo War Crimes trial and reproduced in the book. In it, administrators of all POW camps were told to “annihilate” all prisoners “and not to leave any traces,” presumably before U.S. forces arrive. Schwaner also includes a passage from a camp survivor’s memoir, in which Terry Wadsworth Warne notes that her parents were told the plan was to set afire the main building with all the men and boys in it, and to consider the women and children as hostages to be transported to the front lines. 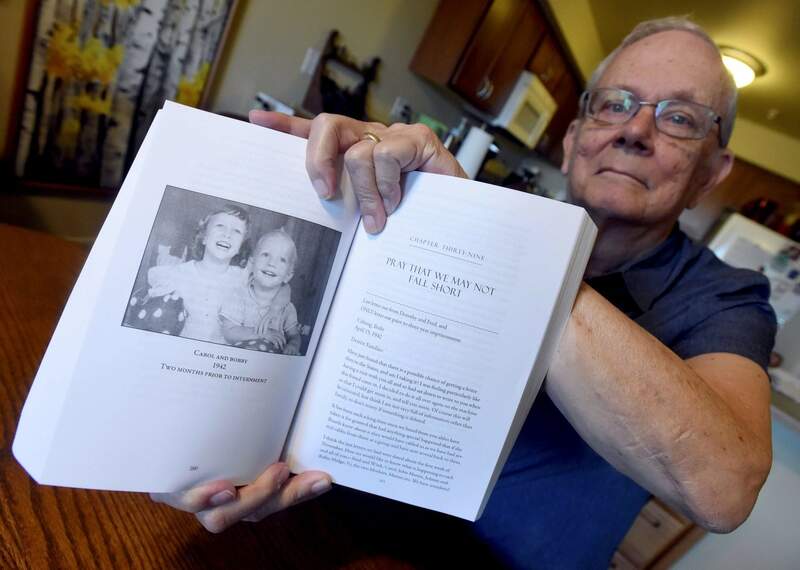 Bob Chambers said one of his memories is of seeing an American mortar emplacement outside their window, and his father showing him the Sherman tanks close up. That was after the rushed arrival of General Douglas MacArthur’s troops. Bob said he later learned about how the prisoner interpreter, Mr. Stanley, despised for what was perceived to be the special privileges he got for collaboration, got word to MacArthur’s troops via a runner that the mass execution was imminent. Bob said the story he read noted that MacArthur sent tanks in a “flying brigade” directly to Santo Tomas, ordering haste and abandoning the plan to fight slowly through Manila. In 1962, Bob wrote a letter to MacArthur, thanking him. “I was amazed when he wrote back,” he said. Bob’s Air Force stint during the Vietnam era also was a thank you. “My dad has preached to me my while life about what I owed the people who had come in and rescued us,” he said. Dorothy abandoned medicine after returning to the states, where Fred first worked at CU as placement bureau director and then as a clergyman with his own church in Fort Collins. Dorothy concentrated on raising her children – Bob said she made all his clothes and that when he went away to college, he didn’t even know his shirt size – and also doing significant community work. In Fort Collins, she was the founder of Elderhaus, a much-copied day care facility for Alzheimer’s patients. She died in Fort Collins in 2001, at age 100. One of the family stories is that after Dorothy graduated from medical school, she conferred with a faculty physician. “I think I’d like to go into OB-GYN,” Dorothy said. The times, they have changed.